"… lively, often hilarious stories from a year or two in the 60's… It is really about people, their foibles and blunders and acts of greatness. The author has such an open-minded, intelligent and humor-filled outlook, that it made me want to read all of his books, no matter what the subject. Greg Palmer sees and writes with intelligence, humor, and heart, and I feel privileged to have him share this slice of his life with us." On Father's Day 2009, The Seattle Times' Pacific Northwest Magazine published this excerpt. 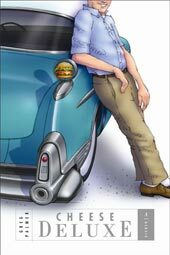 "Palmer makes you smell the hamburger grease, fall down laughing at the dialogue, and weep at the death of a cat. A cat! All along, as through a misty scrim at the back of a stage, you can glimpse the sadness to come, the parting of those who will never know anyone in just this way again. There's a lot more here than a batch of funny stories." Palmer labels Cheese Deluxe a "memoir," but admits that the characters he describes are usually composites, "based on more than one person," that the stories he tells about them, though most "actually happened," may have involved different or multiple characters. Does this admission affect your response to the book? Does the book meet your definition of memoir? Did your high school class have a hangout like the Samoa, what Palmer calls "our final shelter from a world patiently waiting to chew us up"? Does your hangout still exist? Is such a place still needed, or wanted, in an all-wired world? Despite Palmer's claim that most parents of the Samoans "influenced them about as much as they were influenced by the Tibetan Book of the Dead," many of them--even Curtis's father, the Fuehrer--do rise to the occasion, occasionally. Discuss the various occasions of parental intervention throughout Cheese Deluxe and compare to memories of your own parents' roles. Did your parents' actions surprise you? Have you met a person like Don, who knows how "to do a piece of work" and devotes his life, whether by choice or necessity, to that accomplishment? How did s/he influence you? Do you agree with the teacher in Cheese Deluxe who claimed that you would have benefited by working on a punch press in Detroit (or its equivalent) for a year before "inflicting yourself on higher education"? Who was the Janelle of your class, the girl who has a lot more going on in her head than the guys who only dream of "seeing her horizontal" can imagine? Or the Elizabeth, the Very Smart girl who falls for Samoa regular Mike Visser. What do you think of Palmer's contention about Elizabeth and Mike that "It's not true that opposites attract. What is true is that there aren't that many opposites when you get right down to it." Perhaps you yourself were Janelle or Elizabeth. What happened to your class's Janelle or Elizabeth--or both--after high school? Several of the episodes, and emotions, in Cheese Deluxe, involve the car, as a focus of pride and discussion, source of freedom or refuge. Do cars still play the same role in coming-of-age rituals as they did fifty years ago? If not, does any other item function similarly in teen life today? Minor characters throughout Cheese Deluxe--Doris and Whit Whitley, Belle Shanigan Visser, Jack Hibbard, Neil Shulman, among others--are exceptionally vivid. Which would you like to know more about, and why? What kind of future can you imagine for him or her? Palmer's humor ranges from the apt play on words (Stackhouse as a "laid man") or phrasing (Clifford's birth resulting from the effects of an "impertinent Bordeaux") to the character sketch, either quick (Tucker who'd "put on forty pounds, and all of it style") or extended (Wayne's exaggerated naiveté about the Isle of Lesbos off the coast of California). Discuss your favorite "funny part"--if you can without destroying the humor. Do you agree with Palmer's contention, ascribed to a teacher, that after the Boomer Class of 1965, high schoolers were "stoned a lot of the time." How did drugs affect your high school class? Palmer describes teen life on the Mercer Island of the 1960s as "sheltered ... the kind of place where one of the 'gangs' in high school was made up of Drama Club members." Others might characterize it as insular (literally) or homogenous. How does his characterization compare with your experience of high school? What has been gained and/or lost as American life, and its high schools, have become more diverse and inclusive?